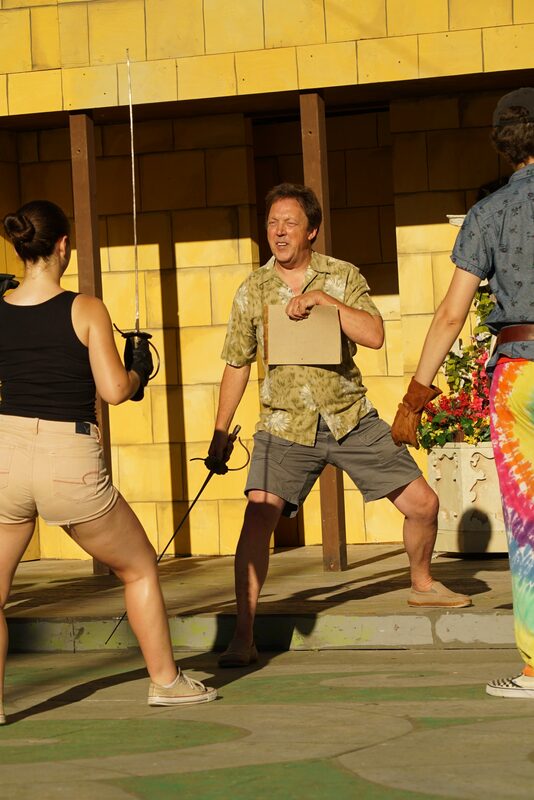 Richard Pallaziol, a Napa resident since 1990, has been a professional stage fight choreographer for the past 37 years and has designed and taught the fights for nearly 300 stage productions throughout California. Both during and after studying theater at CSU Long Beach and ACT in San Francisco, he apprenticed with several fight masters including those of the Society of American Fight Directors. 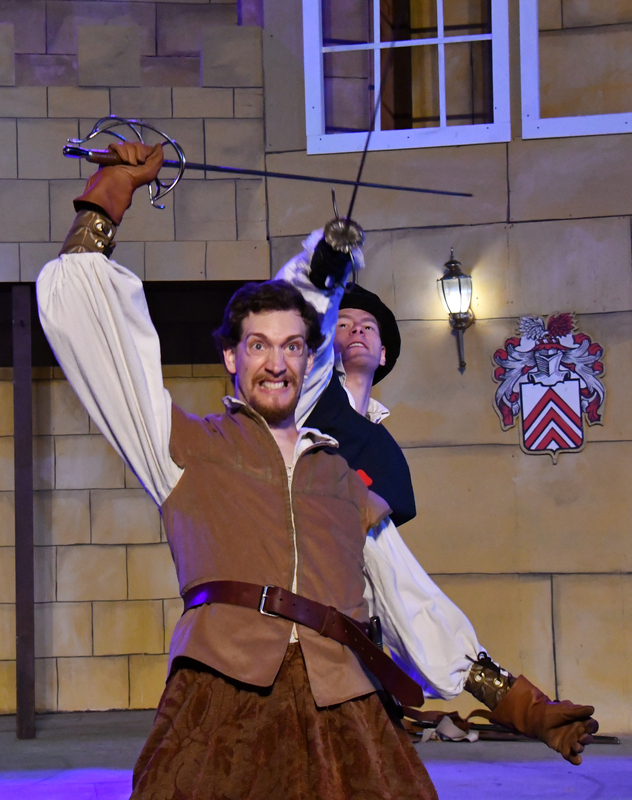 Pallaziol’s first introduction to sword fighting happened when he was 10-years old, when he watched a black and white television broadcast of the 1948 MGM film “The Three Musketeers,” featuring Gene Kelly as D’Artagnan. 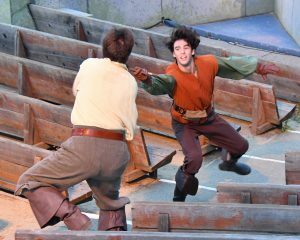 This summer Pallaziol borrows from that first fascination as the fight choreographer for Marin Shakespeare Company’s outdoor production of Ken Ludwig’s “The Three Musketeers,” opening Aug. 4 to Aug. 27, 2017 at Forest Meadows Amphitheatre in San Rafael, Calif.
We asked Pallaziol (who also plays the role of D’Artagnan’s father, King Louis), questions about the art and method of staging and choreographing fight scenes and the special nuances he created for Marin Shakespeare Company’s outdoor production. Q: Talk about your first introduction to sword fighting – “The Three Musketeers” (MGM,1948) featuring Gene Kelly as D’Artagnan. Why is Gene Kelly the model for your passion for sword fighting? Only later could I appreciate that in addition to his incredible physical skills, he used every moment in the fight to bring the audience in to the action. He moves at just the right pace to show you where the danger is, and then how he’s going to get out of it. As a viewer you are invited to see the fight from his point of view, and can begin to believe that you could do the same thing. And he did it without tricks: no flying wires, no deceptive editing, just pure choreography and superb physical skills. I’ve held every other action hero since to his standard. When I finally realized that he was a dancer, I was doubly amazed. Dance became something that I could do too, though I was usually the only guy in a dance class. But, I could put up with all the ribbing and insults, because if Gene Kelly did it, it was plenty enough for me. 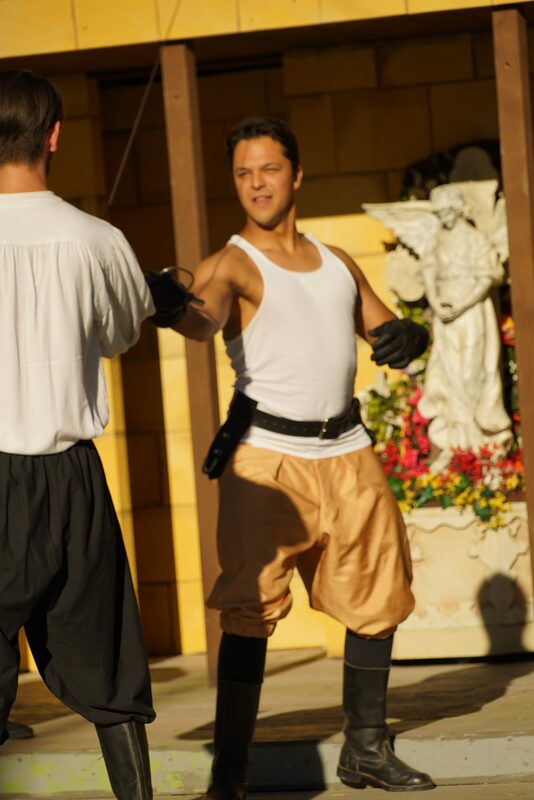 Q: Talk about how you first pursued your interest and study of sword fighting and stage combat. Pallaziol: Even as I studied ballet and other forms of dance, I never stopped studying all forms of martial arts, including fencing. Dance led me to theater and the combination almost automatically took me to stage combat. Although I knew a lot about fencing techniques, I quickly realized that just fighting onstage is pretty boring to the audience. The fighter learns to block and attack at the same moment, never letting the opponent see your plan. Dance taught me that every movement, no matter how small, has to tell a story. The audience has to be shown not only why you doing what you do, and how you feel about that. If they can’t follow your emotional journey, the fight becomes so much filler until something interesting happens. Every stage fight must either propel the plot forward or show something new about the characters. 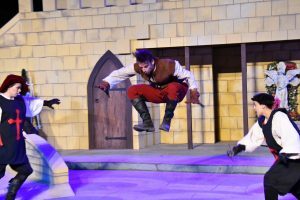 Q: How many moments of violence and fight scenes do you have in the Marin Shakespeare Company’s production of Ken Ludwig’s “The Three Musketeers” ? How do you stage each one to be fresh, exciting and forward the story? Pallaziol: There are 24 moments of violence in this version of the story and 12 that can be considered “fight scenes,” meaning a significant physical engagement of two or more characters. 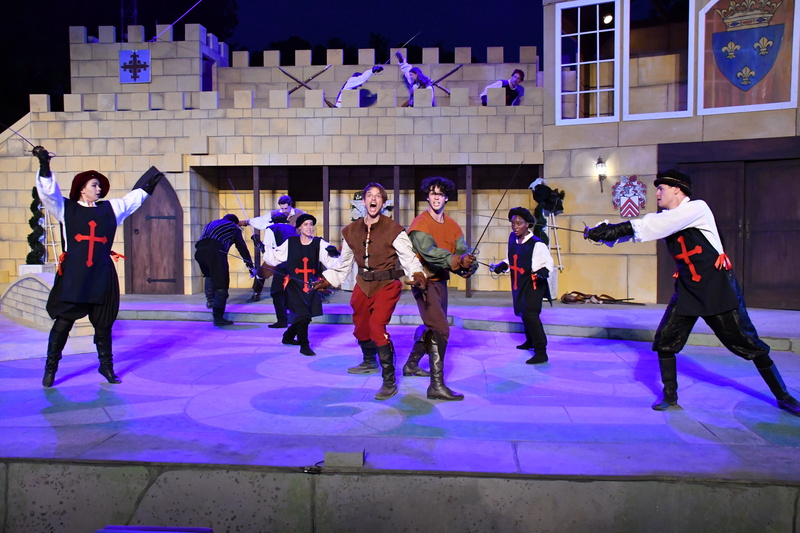 Luckily almost all of the fights spring directly from, or were inspired by, what Alexander Dumas wrote in his novels, so playwright Ken Ludwig provides an excellent blueprint for how the fights should progress. The director will also make very clear what the mood of the scene should be and what elements should take precedence. Using that outline and choosing the strategy of each of the characters in getting what they want, it’s easy to imagine what the fight should look like in broad strokes. After that comes the tough job of filling in all the individual moves, making sure that they match the tone of that scene. As long as you focus on what the character wants, it makes it easy to keep it fresh. Then there is everything that the individual actors bring. They may have certain skills that I can take advantage of, as well as strong insights into the character’s point of view at any given moment. So, even though this is my thirteenth time choreographing a production of “The Three Musketeers,” it is truly the first time that I’m working on this one. It’s all new to me. Q: Talk about the challenges of an outdoor theater setting like Forest Meadows Amphitheatre. Pallaziol: Forest Meadows is a wonderful space for telling big stories. You’ve got the trees as your companions and the starry universe as your ceiling. Whereas in an indoor theatre the action takes place within a “picture-box” frame, here the actors have to think beyond the confines of the traditional space. What may seem daunting is actually a huge benefit. It gives us the opportunity to share more of the story with the audience, not less. We can present huge ideas, grand passions, and yes, big actions. 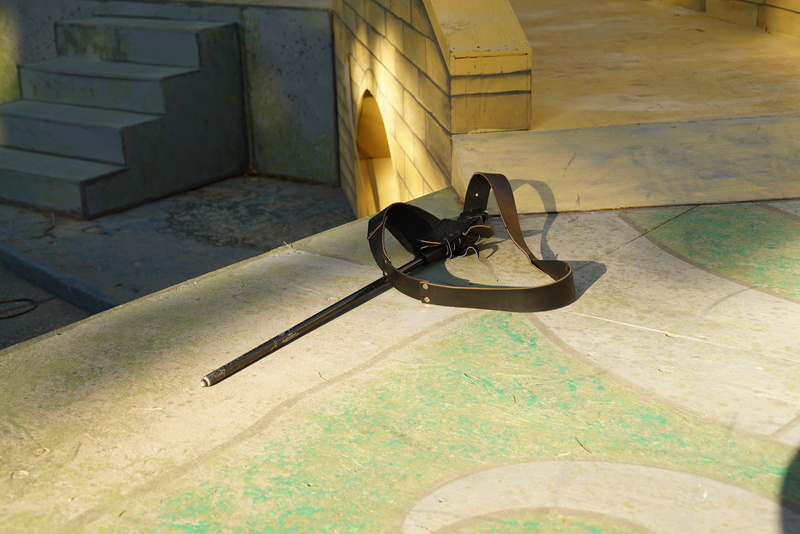 Q: Talk about the importance of staging storytelling moments; how changing the rhythm by freezing or slowing sword play helps audience focus on important story developments. Pallaziol: Along with that comes the obligation to make sure that the audience not miss crucial smaller moments that could get lost in the midst of a grand fight. 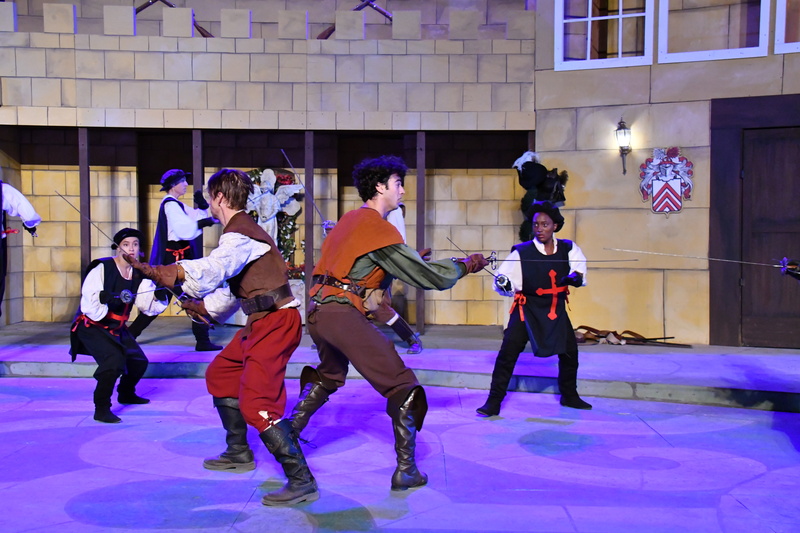 One way to do that is by “stretching time.” In a given fight, for example, the back and forth of the swordplay will establish a certain rhythm, just as music does. Once the audience feels that rhythm, we can either slow it down or speed it up to let them know that something in the dynamics of the fight has changed. If a particularly important moment must be highlighted, one that the audience must see, we can even freeze time for a beat. This can startle the eyes just enough so that we intuitively pay stricter attention to the moment. The very next thing that moves, no matter how subtle, will have everyone’s eyes on it. Movies can do that by skillful editing of close-ups; for stage we have to use other methods. 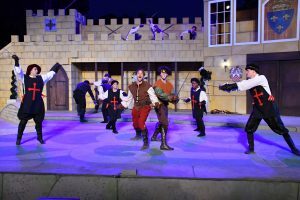 Q: Talk about the challenges and special tricks in staging combat and sword fighting in play that is a comedy or features a lot of comedic elements or plot developments. What about when the story might include the death of an evil or good character? Pallaziol: When actors first approach a show like this (which is really a melodramatic farce) the impulse is to play everything broad and shallow and go for the goofy. But, a fight scene, really any scene, in a comedy has to be played more sincerely than one in a drama, not less. In any drama, each moment has to be given its proportionate weight: you don’t play it too big, you don’t play it too small. In a comedy, each moment, no matter how banal or trivial, for some reason becomes a matter of life or death. That’s why it’s funny. Someone is over-reacting to something that no one else would even notice. So, he emotional stakes have to be huge and it’s the actor’s job to justify it. You can’t just play it big, it has to be big and real. Q: Talk about staging / choreographing fight scenes and sword fighting for a family audience. Pallaziol: I hate to put it this way, but I’ve felt for a long time that both film and stage has put far too much emphasis on blood, gore and agony. The recent success of the movie “Wonder Woman” proves that you can have an exciting adventure film without fountains of blood and hacked off limbs. Having said that, I can understand when the physical realities of violence need to be shown as an object lesson about the horrors of the use of violence. It just isn’t my cup of tea. There have been shows I’ve worked on where the directors wanted pretty graphic violence. I showed them how to do it, but I can’t watch that stuff. This show is the kind of stuff I remember seeing in Saturday matinees. 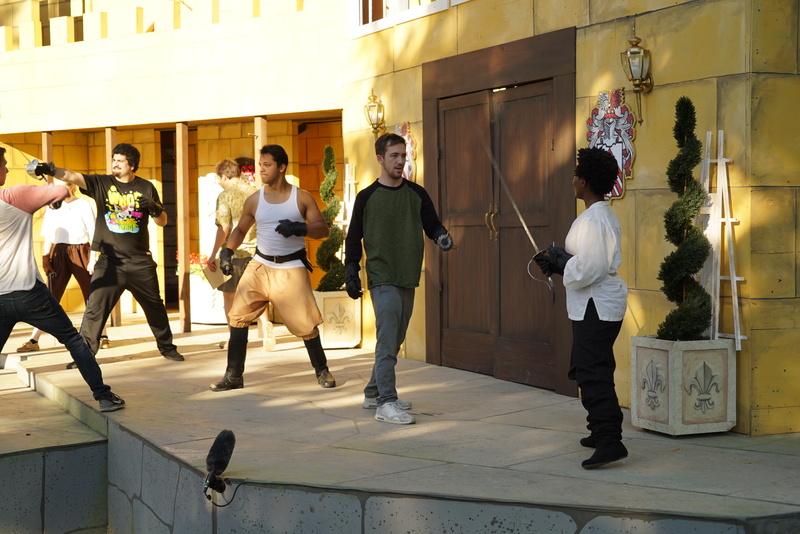 In this story, lots of sword fights means a lot of villains get skewered. But, here it is mainly in the “get touched by a sword, run off stage and die later” vein. I want everyone to feel comfortable watching these fights. I want another 10-year old boy or girl to be thrilled with “The Three Musketeers,” just as I was. Q: Talk about how you combined styles and periods of history in this production relating to novelist Alexander Dumas, playwright Ken Ludwig and classic Hollywood films – while meeting audiences expectations. Pallaziol: “The Three Musketeers” can be thought of as a period piece, but what period? The story line is set in 1625, which would be a brawling burly fighting style with heavy rapier and dagger. But, Dumas wrote the story in 1844 and he has his characters fighting with the sword of his time – the very thin, elegant and lightening fast smallsword and no other weapon. Then each film version has left an indelible mark in people’s imagination as to how a musketeer should fight. Finally, Ken Ludwig wrote this stage version in 2008, with his own ideas as to how the fights should look. I have tried to create a somewhat consistent style of fighting that I hope will please all lovers of this story, no matter where they jumped aboard. And if this is their first time, I hope it is an exciting introduction. Q: As a respected and experienced fight choreographer, could you critique the Gene Kelly performance in “The Three Musketeers” that inspired your profession. It’s nearly 70 years after the release of the MGM film and Kelly’s fight scenes are still considered dynamic and entertaining. Why? Pallaziol: Kelly’s performance in the fight scene is a cinematic marvel. He had already choreographed the dances in eight prior films, so he was completely comfortable in using the medium to best showcase movement. Of special note is how natural the location scenes are. Other action films often run into a problem staging fights outside of a sound stage, but Kelly uses the landscapes perfectly, whether field, lakeside or seaside. Of course his powerful dancing skills made possible moves that other actors could not perform. But, he knew not to make them seem too easy. We see the athlete working; any less and he would have become less real, something that we can’t achieve. He knew to make his hero an almost-everyman, something just shy of being possible. He learned fencing for this film and his moves are not only correct but endowed with weight and power. Better film fencers would come along, but none of them ever looked more like a scrappy fighter than did Kelly. 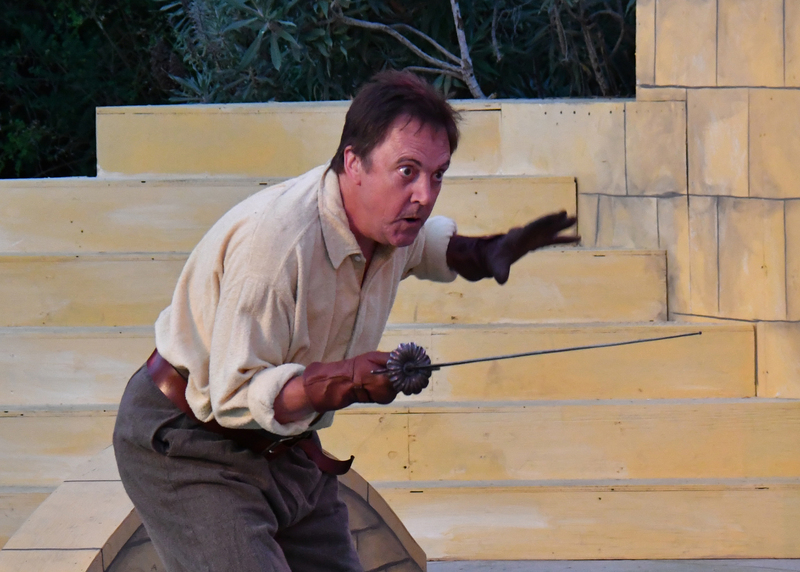 Interview by Kim Taylor, Marin Shakespeare Company publicist. 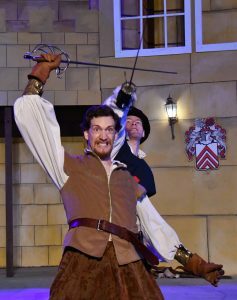 Photos from rehearsals of Marin Shakespeare Company’s THE THREE MUSKETEERS. Photos: Jay Yamada.